Caltha palustris.© 2001 Eleanor Saulys.www.ct-botanical-society.org. (Accessed 5/2014). 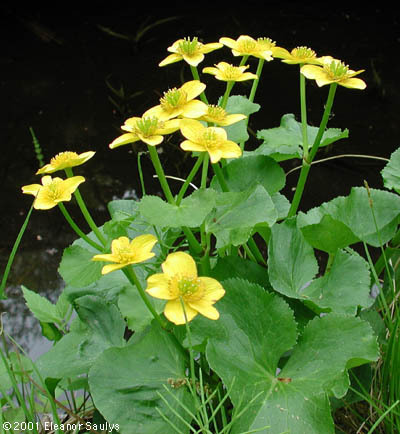 Caltha palustris is a perennial herb, to 60 cm tall, poisonous when fresh. Contains an unstable oil, protoanemonin (Kingsbury 1964). Stems hollow, branched above. Leaves alternate, broadly heart-shaped to kidney-shaped, base deeply lobed, with broad sinus, tip rounded, margin toothed, lower leaves long-stalked, upper becoming almost stalkless. Flowers bright yellow, to 4 cm wide, sepals 5-9, petal-like, stamens numerous, April-June. Fruit dry, clusters of dry narrow capsules to 1.5 cm long. Habitat: Along open streamsides, pond edges. Notes: Sometimes confused with Ranunculus ficaria (lesser celandine), an upland, non-native, aggressively colonial plant.